1. For the purpose of these Terms & Conditions the following words shall have the following meanings: (a) "The Company" shall mean Supa Nova Electrical Power & Plumbing. (b) "The Customer" shall mean the person or organisation for whom the Company agrees to carry out works & supply materials. The Engineer shall mean the representative appointed by the Company. 3. HOURLY RATE WORK. The Customer shall only be charged for the time spent related to the Customer's work, all other time, personal mobile calls etc. is non-chargeable. 4. Where a written estimate has been supplied to the Customer the total charge to the Customer referred to in the estimate be revised in the following circumstances: (i) if after submission of the estimate the Customer instructs the Company (whether orally or in writing) to carry out additional works not referred to in the estimate. (ii) if after submission of the estimate there is an increase in the price of materials. (iii) if after submission of the estimate it is discovered that further works need to be carried out which were not anticipated when the estimate was prepared. (iv) if after submission of the estimate it is discovered that there was a manifest error when the estimate was prepared. 6. Invoices paid late carry a interest rate of 4% per month. However, this is applied at the sole discretion of the company and is not applied automatically. 7. Where the date and / or time for works to be carried out is agreed by the Company with the Customer, then the Company shall use its best endeavours to ensure that the operative shall attend on the date & at the time agreed. However, the Company accepts no liability in respect of the non attendance or late attendance on site of the operative/engineer or for the late or non delivery of materials. 8. If the Customer cancels their instructions prior to any work being carried out or materials supplied then the Customer shall be liable for any related expenditure by the Company had the work been carried out and / or materials supplied in accordance with such instructions. 9. If, after the Company shall have carried out the works, the Customer is not wholly satisfied with the works then the Customer shall give notice in writing within 12 months to the Company & shall afford the Company, and its insurers, the opportunity of both inspecting such works, & carrying out any necessary remedial works if appropriate. The Customer accepts that if he fails to notify the Company as aforesaid then the Company shall not be liable in respect of any defects in the works carried out. 10. The Guarantee shall be for labour only in respect of faulty workmanship for 6 months from the date of completion with the manufacturers warranty in force. The Guarantee will become null & void if the work/appliance completed/supplied by the Company is: (a) Subject to misuse or negligence. (b) Repaired, modified or tampered with by anyone other than a Company operative. The Company will accept no liability for, or guarantee suitability, materials supplied by the Customer & will accept no liability for any consequential damage or fault. 11. The company will not guarantee any work in respect of blockages in waste & drainage systems etc. Work is guaranteed only in respect of work directly undertaken by the company & payment in full has been made. Any non-related faults arising from recommended work which has not been undertaken by the company will not be guaranteed. The company shall not be held liable or responsible for any damage or defect resulting from work not fully guaranteed or where recommended work has not been carried out. Work will not carry a guarantee where the customer has been notified by the operative either verbally or indicated in ticked boxes or in Comments/ Recommendations of any other related work which requires attention. 12. Where the Company agrees to carry out works on installations of inferior quality or over ten years old at that date no warranty is given in respect of such works & the Company accepts no liability in respect of the effectiveness of such works or otherwise. 13. 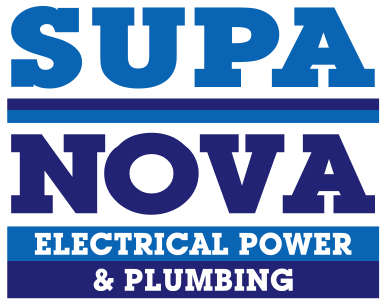 The company ensures all engineers are Plumbing & Electrical Safe Registered under Supa Nova Electrical Power & Plumbing CC Registration Number. 14. These terms & conditions may not be released, discharges, supplemented, interpreted, varied or modified in any manner except by an instrument in writing signed by a duly authorised representative of the Company & by the Customer. Further, these terms & conditions shall prevail over any terms & conditions used by the Customer or contained or set out or referred to in any documentation sent by the Customer to the Company; by entering into a contact with the Company the Customer agrees irrevocably to waive the application of any such terms & conditions. 15. The Company shall not be liable for any delay or for the consequences of any delay in performing any of its obligations if such delay is due to any cause whatsoever beyond its reasonable control, & the Company shall be entitled to a reasonable extension of the time for performing such obligations.